​Do you ever have to spend time wrestling with a verse before it starts to become clear? Sometimes it’s helpful to look at a verse in smaller pieces so that God can bring the big picture together in our hearts and minds. God said: “Let light shine out of darkness.” At the creation of the world, God spoke light into being. He made light to shine when previously there was nothing but darkness. God does the same in each of our hearts as we are made new creations in Him. Before Jesus we were all living in the darkness of the world. 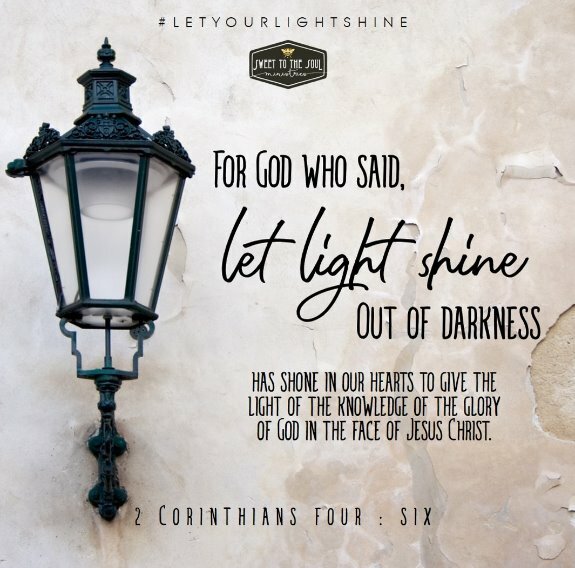 The final portion of our key verse, overflowing with prepositional phrases, reads: “the light of the knowledge of the glory of God in the face of Jesus Christ.” This means that, as believers, we know that it is God’s glory shining in and through Jesus; that Jesus is God Incarnate, God in the flesh. But, to a nonbeliever, many of the truths that we know and hold dear, may border on the ridiculous, too far removed from their daily reality. Most of us have loved ones, family members and lifelong friends, who do not believe as we do. They do not know Jesus nor do they see the need for Him in their lives. As believers, we know the eternal implications and the eternal importance of a life in Him. We have a responsibility to share the gospel, most especially with those we love. They may never open the Word of God or attend church. But they will see us and watch how we live out our lives - our real, ordinary, sometimes challenging daily lives. In this, we have great opportunity and great responsibility. A responsibility that we cannot take lightly. In fact, it was not that long ago that my own mind was blinded. I remember when I would read the Bible only to find fault and disagree with the words on the page. As Paul writes, my mind was dull and a veil covered my heart. It was not until I turned to the Lord that the veil was taken away. I turned to the Lord in part because of a conversation initiated by my baby sister. I remember the day she asked “Who is Jesus to you?” From my answer, it was immediately apparent to her that I did not have a personal relationship with Jesus. The question was not easy for her to ask; I am the oldest, a leader; she, the youngest, a follower. But I thank God, that on that day, she followed His leading and was brave enough to ask her big sister a difficult question. It would be many months and conversations later before I would finally come to know Christ for myself, but I can look back and see it all began with a question posed by my baby sister. A light doesn’t have to preach, a light simply shines. · We are the light of the world. We are to shine. 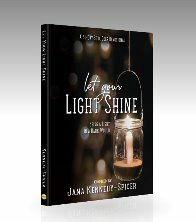 · We are to shine so that others will see Jesus in us and through us. · We shine by staying close to the light source. We stay plugged in to Him. · We live in the Word and we live out the Word. · We pray. Even when it’s hard, especially when it’s hard, we pray. So, with Jesus in our hearts, we shine. Dear God, I want to be a light who shines for you. Even if others can’t name it or aren’t sure what is different about me, may Jesus be seen in me. Please help me to humble myself and to get out of your way so that Jesus may shine through me. Please help me to decrease, so that He may increase in me. Please help me to love well. Please help me to live a life in which my actions speak louder than my words. Please help me to love well not only in word or talk but to love well in deed and in truth. Please help me to be a woman who not only loves your Word but a woman who lives out your Word so that others may see the Word through me. God, may I never forget - it is You who saves, I am simply meant to shine so that through me others may see you. In Jesus’ holy and precious name I pray, Amen. 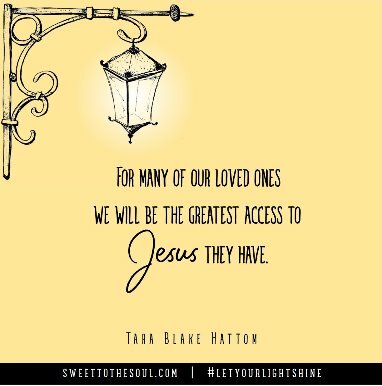 ​Tara Blake Hatton is a mama, a wife, a teacher, a sister, a daughter, and most importantly a follower of Jesus and a child of God. She has two little boys who love to run and jump and yell and scream and seem to love being attached to their Mama. She has also been blessed with a “bonus” child, stepdaughter Kaleigh, who just turned 12 and does her best to tolerate the antics of her little brothers.